In August 2007, GRRIN lost a great friend and supporter, Teri Osbon-Kitzelman. Teri was an animal lover throughout her life. In 2002, Teri and her husband Mark Kitzelman lost both their senior Goldens within a few months, and they came to GRRIN in hopes of finding another dog to love. 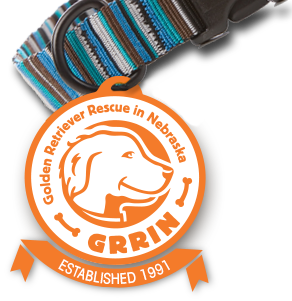 Around that time, an area shelter contacted GRRIN about a Golden puppy that had been left tied to the shelter door during the night. Mark and Teri had been planning to adopt an older dog, but somehow this little puppy seemed like he might be a perfect fit for them. When we called to ask Teri if she would be interested in a puppy, she didn’t hesitate for even a second! The first words out of her mouth were, “How soon can we get him?” Teri brought the little guy home and named him Harry after a grandfather. Harry was a fun-loving, mischievous puppy who loved everyone and enjoyed being the life of the party. 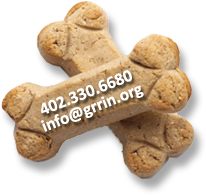 Several months later, Mark and Teri decided he needed a buddy, and again they called GRRIN. This time, they adopted a young adult and named him Tony, after another grandfather. Tony was a much more serious dog who had his work cut out for him, trying to keep Harry in line! The two dogs became great pals, but Teri explained that if Harry got too rowdy, Tony would sit on him to settle him down! Teri always had funny stories about the antics of these two dogs. She loved them dearly, and they made her laugh every day. During her illness, they were her constant companions, spending their time in or next to her bed. After Teri passed away, her friends and family held a benefit in her honor, and per Teri’s request, a portion of the proceeds were donated to GRRIN. Teri had the same joyful, loving personality that we see in our Goldens, and she is deeply missed.